Procedure apps appear to be all the rage lately in the mobile medical world, and rightfully so. These instructional apps are a valuable resource to those learning how to do procedures in the health care world. We reviewed another Procedures app recently, Procedures Consult-Internal Medicine, that covers a wide variety of procedures. However, this app focuses on one specific procedure, and is a fraction of the cost. 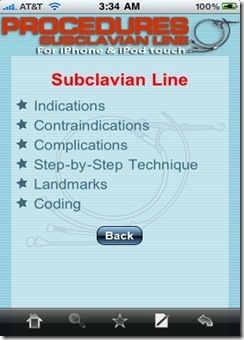 Procedures – Subclavian Line, is a $2.99 app produced by MeisterMed. 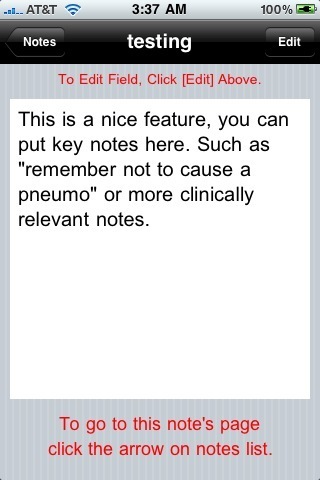 You might remember one of our previous reviews on a MeisterMed app, PediDoser. We weren’t huge fans of that app (although to their credit, PediDoser has a 3.5 star rating in the App Store). Nonetheless, once I tried out this current app for this review I was definitely impressed. I’ve had the opportunity to do a few subclavian lines as a medical student, and the experience is exciting and frightening at the same time. The best way to learn at first is to see, but unfortunately you don’t always have a good view, or the resident might not be the best teacher. Thats where this app comes in. The navigation is pretty simple. When the app opens you have the option to view the procedure details or watch the full video. In the procedure details section you have a few different options, from step-by-step instructions to complications and coding numbers. There is also a toolbar at the bottom of the screen. It contains navigation tools, bookmarking, and an option to write custom notes. The bookmarking feature was not useful, but the custom note feature was a nice touch. The video is approximately 10 minutes long and included within the app. You don’t need internet access to view the video. It shows the full procedure being done from start to finish. The audio component of the video is instructional. I found the audio to be layered nicely with the video. The instructions were concise, high yield, and the explanation of the procedure was excellent. There is a separate text section step by step instructions. Overall video is great, but at 10 minutes in length, it would be nice to see the video broken into separate sections that are easy to access. The step by step text instructions only contain one picture. More pictures would be nice additions to this section. 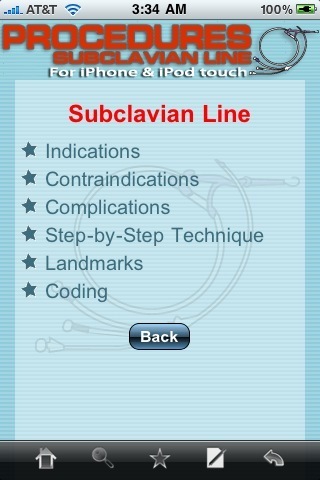 This is a great medical application for those learning how to do subclavian line procedures. It’s simple, easy to use, and easily accomplishes its goal of teaching how to put in a subclavian line. Like I’ve mentioned with past procedure applications, there is no substitute for getting lots of supervised practice before actually doing this procedure on your own. However, this app definitely reduces the apprehension felt when attempting this procedure for the first time under supervision. I could also see it helping speed up the learning time needed for this procedure. The previous procedures app we reviewed, Procedures Consult-Internal Medicine, had 25 procedures explained(including subclavian line), but costs $39.99. We really liked that app, but if you don’t need access to all those procedures or don’t want to spend that much right now, then this app is a great buy at $2.99. I’d definitely recommend this medical application as a must have for 3rd/4th year medical students, interns, residents, and other healthcare professionals who are learning to do subclavian lines. Thanks for the review. We have several more procedure references for the iPhone in the works. Coming soon to an App Store near you. Sorry. 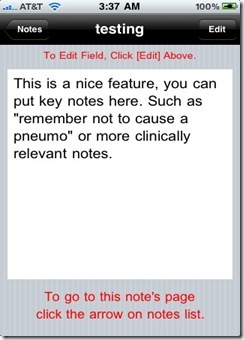 Forgot to add that we’ve put out a lumbar puncture procedure App as well. I’ll send you a copy if you’d like to take a look and do another review. @Aschectman: Yea if you could send us a copy of the LP app that would be great. Are you working on any more procedure apps? I like the new site format but the images with this review are from PediDoser, not the Subclavian Line App. Things must have gotten mixed up in the transition.